WELCOME to the second South Dakota Breeding Bird Atlas! 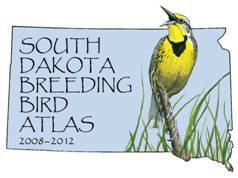 The second South Dakota Breeding Bird Atlas, starting in 2008, is a statewide survey to determine the current distribution and status of every bird species breeding in the state of South Dakota. These results will be compared to bird distributions during the first SDBBA (1988-1992) to see what changes have occurred. The surveys are done on 425 3-mile x 3 mile randomly-selected blocks of land, including 124 random blocks from the first atlas. Primary focus of surveys is to document all breeding birds in a block by surveying all of the habitat types within the block. Bird observations are categorized as Possible breeding, Probable breeding, or Confirmed breeding, based on a series of standardized criteria, within that species’ breeding season, which is defined by ‘safe dates’. The atlas will primarily be conducted by volunteers like you. Atlasing is a great opportunity to contribute to the knowledge of South Dakota birds while having fun and learning about your local birds and their habitats. Read the Atlas FAQ and browse through the links on this web site to find out more. See the online interactive map for block locations near you. Atlasing is birding at its most useful, most educational, and most addictive! Continue reading to see how to get involved. NEW!! Updated versions of the Atlas Handbook, Block data sheet, and Habitat codes . Make sure you have the most recent copies! NEW!! Check out our new MAP - updated with block availability. Choose your blocks, talk to the Coordinator, and start atlasing! Click here for a map of atlas blocks locations. Contact the coordinator to reserve your blocks and get detailed information about your blocks. Click to download materials or contact the coordinator to receive a packet in the mail or electronically. The SDBBA2 is coordinated by The Rocky Mountain Bird Observatory, Brighton, CO.